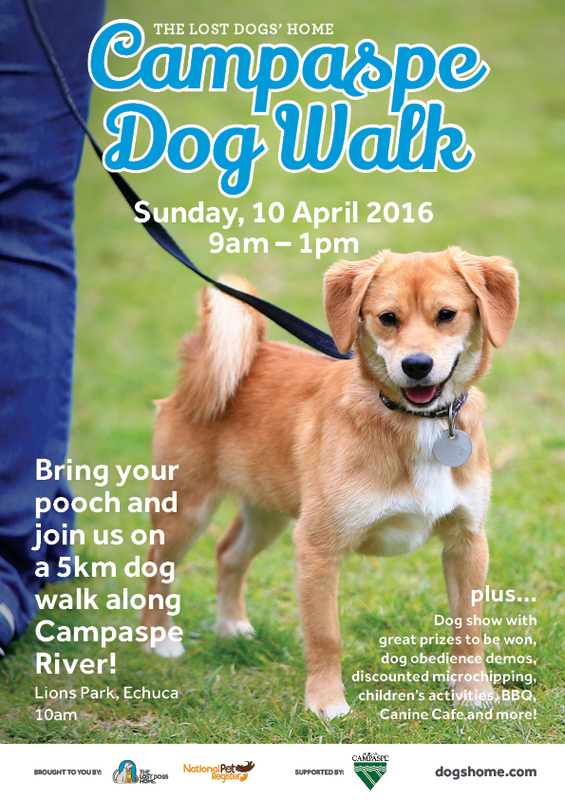 NEWS: The Campaspe Dog Walk is on this weekend! It’s time to grab your walking shoes and your four legged friend and head on down to Lions Park, Echuca for the 2016 Campaspe Dog Walk this Sunday April 10. The day promises something for everyone, including the popular five-kilometer dog walk. Starting at Lions Park, participants will travel along the picturesque Campaspe River before heading back to the park for more great activities. For a gold coin donation, dog walkers will be able to register between 9 and 10am at Lions Park before the walk starts at 10am. Funds raised from the dog walk will go towards caring for the 1,500 lost and abandoned cats and dogs coming through the Home’s Campaspe shelter every year. There are a great number of activities for the whole family on the day including obedience demonstrations by the team at the Echuca and Moama District Obedience Club, face painting and the Canine Café courtesy of Rose’s Veterinary Practice. So spread the word and head on down to Lions Park, Echuca this Sunday for the Campaspe Dog Walk and say hello to the team from The Lost Dogs’ Home. Thank you to the following local business and community organisations supporting this year’s Campaspe Dog Walk.